Located on the Missouri River, America's first highway west, the citizens of Washington, Missouri have seen their share of history flow before their watchful eyes. 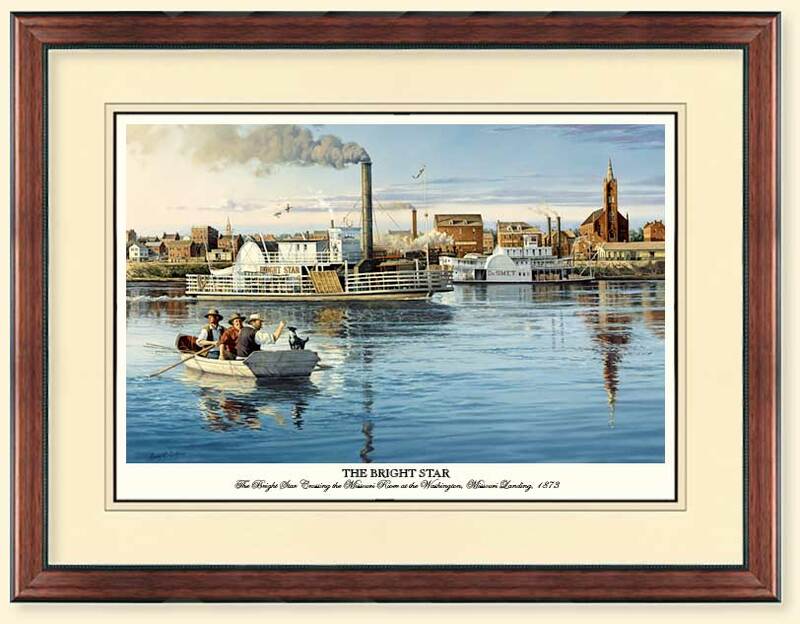 The small river town was founded in 1839; however, the first permanent settlers started to arrive, by keelboat, in the late 1820's. They were Germans fleeing from an oppressive environment in their homeland. The new inhabitants were industrious individuals possessing an exceptional work ethic. The citizens soon were able to build this new settlement into a viable and prosperous small town. In the painting, The Bright Star "Crossing the Missouri River at the Washington, Missouri Landing, 1873", you can hear the sound of the locomotive as it glides into town. The passengers traveling west crane their necks to see what they can of Washington. The observer cannot help but be impressed with the number of brick buildings in the new community; thus, symbolizing a durable attitude toward the future. The dominance and the size of the churches looming on the skyline demonstrate a strong religious and moral conviction by its citizens. Each shop, home, and business shows the care given by its owners. Workers at the feed store give us a friendly wave. To the right we see the river and the beautiful and stately steamboat, DeSmet, on her way to Ft. Benton, Montana. The river, home for many travelers for thousands of years, is home for the BRIGHT STAR. The BRIGHT STAR seems to be a symbolic link to all the vessels that have tied off at this river location. 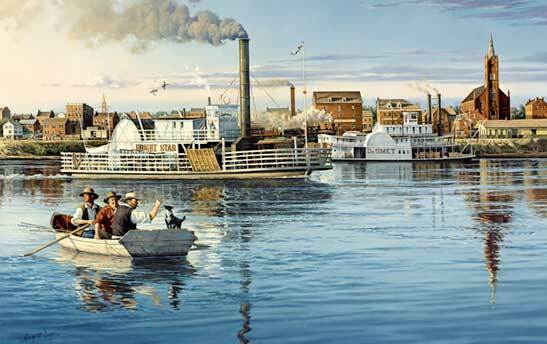 We see her steaming on another trip to a north bank location with her usual passengers of citizens, farmers, and travelers. As the travelers continue west, they can catch a glimpse of three fishermen returning with their early morning catch. Their dog must like to fish too.